Conneaut Creek is the stream furthest to the west in Erie County. The mouth of this creek is at Conneaut Harbor in Conneaut, Ohio. It is stocked with steelhead by both Ohio and Pennsylvania fish authorities and by PF&BC cooperative nurseries. Much of this creek is located in Ohio. It enters Erie County south of Interstate 90 and a good distance south of the Lake, and winds through rural lands to beyond Albion, Pennsylvania. It is an approved trout water only south of Erie County. Conneaut Creek is the only creek in this watershed that has areas which have a sand and dirt bottom, rather than a shale bottom like the remaining creeks. It drops-off quickly from its banks, and it can be hard to wade in many areas. It holds bass and northern pike during the summer months. Steelhead run in Conneaut Creek as far south as Dicksonburg in Crawford County. Angler pressure on Conneaut Creek is relatively light. However, in 2002 the PA Fish and Boat Commission began stocking steelhead into Conneaut Creek and it is likely angler pressure for steelhead will increase over time. In addition to steelhead, Conneaut Creek has a very good fishery for muskellunge throughout its run through Erie County. Most fishing for muskie is done in the summer and fall. Conneaut Creek also has a good walleye and largemouth bass fishery, although few specifically target these species in Conneaut Creek. The PFBC stocks this creek with muskie, tiger muskie and walleye. There is no good access to Conneaut Creek on the north side along Clover Road. The first access to the Pennsylvania waters near the Ohio line is at the bridge on Griffy Road. There is very limited parking on the southeast side of the bridge. There is also a nice pool under and just downstream of the bridge. Route 6N crosses Conneaut Creek twice in Erie County. At the first overpass to the west, there is ample parking all along the bridge on 6N. The shale cliff on the south side makes access somewhat difficult, especially on the southwest side. Proceeding east the next access point is on either side of McKee Road. Until recently there was a historic covered bridge where McKee Road crossed the creek. The bridge burned in the late 1990's. It has not been replaced and therefore McKee Road dead-ends at the creek from both directions. You can park and access the creek at either end of McKee Road, whether you come from the north off Old Albion Road, or from the south off Cherry Hill Road. Sometimes on the north side of the creek at the end of McKee you will find people camping near the creek - exactly why they are there is less than obvious. Upstream from McKee Road the creek becomes more muddy and slow-moving, and the banks become more muddy and steep. The combination of steep banks and a muddy bottom makes wading difficult in many places downstream from McKee Road. The next access east of McKee Road is at Route 215. There is limited parking available at the northwest end of the bridge. There is no easy access to the creek from Old Albion Road. There is also no parking along Cherry Hill Road where it passes over the creek. However, there is limited parking on Gage Road just east of Cherry Hill Road, and you can walk to the Cherry Hill Road bridge from here. If you turn west on Hilltop Road, a short distance from Cherry Hill Road you will find a partially constructed road heading toward the creek. You can park here and walk down the trail to the creek, where you will find an old bridge abutment and a pool. South of Hilltop Road the East Branch of Conneaut Creek and Temple Creek branch off to the east of the main stem. Route 6N crosses Conneaut Creek a second time just west of Albion. There is limited parking on the northwest end of the bridge here. The final access point shown on our maps is at Carter Road. There is ample parking along the bridge here. In this area the creek here passes through pleasant farm county. Raccoon Creek is a small stream that holds some steelhead. Its mouth is located west of the town of North Springfield, just west of Elmwood Home Road (Township Road 324). Raccoon is not an approved trout stream and it is not stocked with "regular" trout for the trout season. However, there is evidence of natural reproduction of trout in this creek. Occasionally the PFBC puts spawned-out steelhead in Raccoon Creek near Ellis Road. Most of Raccoon runs through wooded lands, and portions run through State Game Lands 314. 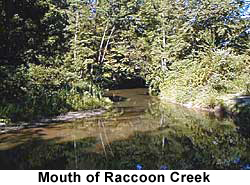 Because of its small size and because it runs primarily through woods, Raccoon drains quickly and can be fishable when the larger creeks are too high or muddy from recent rain or runoff. Racoon Park, a nice community park with picnic pavilions and plenty of parking, is located just east of the mouth of Racoon Creek. The creek has a slow, wide and reasonably deep area at its mouth in this area. Much of the fishing in Racoon Creek is done here at the mouth. You can also walk upstream from Old Lake Road and fish the stream. Heading south on Elmwood Home Road, you enter the State Game Lands. You can walk into the Game Lands and fish the stream here. You can also access the stream by parking along the Conrail tracks (which are the northern set of tracks) and taking the steep but short trail down the south side of the tracks to the creek. Here you will find a tube under the bridge and some nice fishing areas. There is also access at the bridge on Lynch Road north of Route 5. There is limited parking here and the stream is brushy. Trying to fish this area or areas upstream of this with a long rod will be very difficult. The next access points are where Elmwood Home Road crossed over the creek, and at the Route 5 bridge, which is just upstream. If you want to try a smaller stream, with few other anglers, try this one. 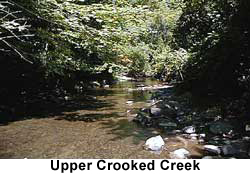 Crooked Creek is the third largest of the western creeks and holds a good population of steelhead. Its mouth is located east of Holliday Road (Township Road 342) and Virginia's Beach, and north of Camp Fitch. Exiting Interstate 90 at the East Springfield exit (Exit 2; Route 215) and traveling north on Route 215 will take you to the lower reaches of Crooked Creek. Turning east from Route 215 onto either Route 20 or Route 5 will take you over the creek. Crooked Creek is an approved trout water, and is stocked from its mouth upstream to Glosky Road off Lexington Road (the second road south of Interstate 90). The area from the Ables Road bridge south to Happy Valley Road is the most popular area to fish. This area flows mostly through woods and has a reasonably good flow rate. Above Route 5 there a portions of the creek that are narrow and brushy. Because it flows through farm fields, after rain or a snow melt Crooked Creek is often the first creek to discolor and the last to clear. It can also be low and slow when the conditions at Elk and Walnut are better. Crooked Creek frequently does not experience the fishing pressure Elk and Walnut receive. TherThere is a good fishable area at the mouth, but you must park a distance west of the mouth and walk along the lake shore to get to the mouth of the creek. Drive to the very end of Holliday Road to the Virginia's Beach Campground. Park along the roadway just south of the No Parking signs. Although there are cottages and a road going east toward the creek, you cannot get all the way to the creek on this road without running into posted property. You must walk down to the lakeshore and walk along the beach to the mouth. You can fish at the mouth and a short distance upstream to where it is posted. Upstream are nursery waters in which you cannot fish. The nursery waters extend through Camp Fitch and up to the first bridge at Ables Road. The first upstream access point is at the Ables Road bridge. You can fish from the bridge upstream; downstream is the nursery waters where fishing is prohibited. There is also very limited parking along the east side of Holliday Road between Ables Road and the railroad tracks at a small pull-off as you are heading down the hill. A trail will take you down to the creek. The next access point is at the Conrail tracks. You can park along the tracks and walk down to the creek. It is very difficult to get through the tubes here and you may have to walk up and over the tracks to access the other side. You can also park on Route 5 just east of the creek and walk down to the creek and fish either upstream or downstream (although going downstream you will hit the Conrail tubes quickly). There is limited parking available at the Happy Valley Road bridge and you can fish upstream or downstream from here. The next access point is at the Route 20 bridge. Although you can fish upstream or down, it is brushy upstream and the creek branches off a short distance upstream from Route 20. You can fish the west branch by parking at the intersection of Tubbs and Springfield Roads. The The The upper-most access points are south of Route 90. The first access is at the Springfield Road bridge. Here there is a tube under the road, a significant waterfall at the tube, and a sizable pool just below the waterfall. The upper-most access point is at the Glosky Road bridge, which is a short distance upstream from the Springfield Road bridge. 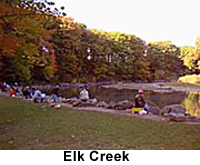 Elk Creek is the largest and most popular of the Erie County tributary streams. It enters Lake Erie about one-half mile west of State Route 18 in Girard Township. Elk starts south of the Town of McKean. It flows under Interstate 79 at the McKean exit (Exit 39), under West Road (State Road 3020) in the Village of Sterrettania, under State Route 98 at Folly's End Campground south of the Town of Fairview, under a scenic covered bridge on Gudgeonville Road (Township Route 400), then northwest through a mostly wooded area passing under Interstate 90, then north under U.S. Route 20 in Girard and under U.S. Route 5 in Lake City and on to Lake Erie. Elk is stocked with steelhead and brown trout. It is an approved trout water and is heavily fished early in the regular trout season. During the summer and fall, the lower reaches of Elk hold bass, panfish and catfish. Like the other creeks in the watershed, by June most parts of the creek are low and too warm for trout and the fishing for steelhead and stocked brown trout is over. During early fall, steelhead may not get beyond the Route 5 bridge. The fish move upstream as the season wears on. By winter, steelhead can usually be found all the way upstream beyond the McKean exit of Interstate 79 (Exit 174). There is a sizable parking and picnic area at the mouth of Elk. There are outhouses, covered picnic facilities and paved parking lots. There is a boat launch at the access area. 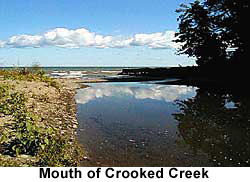 Although small boats can be launched from this site, boats headed for the deep waters of Lake Erie may find themselves stuck on a sandbar at the mouth of this creek. The mouth access area can be reached from the road located part-way up the hill on Route 5 west of Route 18. An unofficial-looking sign on Route 5 stating "Elk Creek Access Area" marks the spot. The PF&BC has recently installed a parking lot on property it acquired on the east side of Elk Creek just south of the mouth. Turn off Route 5 at the Elk Creek Sport Store and drive north toward the Lake to the bottom of the hill. The parking lot will be on your left. This provides access to the east side of the lower reaches of Elk Creek. The area from the parking lot to the lake is a wide and slow-moving estuary. There is some fishing for a short distance along the west bank below the parking lot before the shale cliff rises. If you enter from the main parking lot, to fish below this area you must either wade across to the other side of the creek (it can be deep; hip boots probably won't do it), or you must take a rough path up along the west side of the creek and down to the mouth. The path entrance is at the north end of the lowest parking lot. There is a sizable fishable area at the mouth (as well as a nice beach). This is almost always very slow moving. Some anglers drift or fly fish in this area, while others still fish. In the early fall, when there has been little rain and the creeks are low and clear, the mouth of Elk is very popular for steelhead. Because it is deep and slow, it may be one of the few places holding steelhead. During these times the fishing pressure in this area can be very heavy. This area is also popular for catfish. The catfish run into the creek when the forsythia bloom in the spring. Most of the fishing for catfish is done at night. Suckers also run up Elk Creek in the spring. Just south of the parking lots at the access area Elk begins to flow more rapidly. The area from the parking lots south to the Route 5 bridge can hold steelhead early in the season. It can also experience significant fishing pressure. It can be difficult to wade south past the tubes below Route 5. There are a number of access areas from Route 5 south to Girard. Almost all of the parking and access upstream from the Elk Creek Access Area is on private lands. Parking and fishing is provided only by owner permission, which can be withdrawn at any time. Please respect their property. In 2001 parking along Route 5 was prohibited and it remains that way now. A private, paid lot is sometimes in operation on the north side of Route 5 just west of the stream (but you can walk to here by going into the access area and parking in the first, upper lot). Sometimes you can drive into the campground off Route 5 at the bottom of the hill, but most times this too is posted. Upstream the creek runs through property owned by Fairview Evergreen Nurseries. Although this is private land, the Nurseries do not post it and currently permit angler access. There is a place to park next to the creek just south of the Conrail tubes beneath Route 5. There is also access off North Creek Road (Township Road 543) both north and south of the railroad tracks. You will see rough roads on the west side of the road both north and south of the narrow railroad underpass. North Creek Road intersects Route 5 part way up the hill past (or west of) the creek. There is good fishing on both sides of the railroad bridge. All parking and access in this area is through the courtesy of Fairview Evergreen Nurseries. A popular access point is at the steel bridge on Elk Park Road (Township Road 544). The fishing can be good both upstream and downstream from this bridge. Further upstream the creek can be access from the Girard Park. There is a small and not-too-well marked access road off Lake Street in southern Girard. This access road splits and goes to both a park (this road is sometimes blocked-off), and a sewage treatment plant. You can park at the either location and access the creek. Another very popular spot is the "American Legion hole." This is a good but slow-moving and heavily fished hole. It is accessed by taking a spur road which angles off to the south from Route 20 just west of Girard as you start down the hill toward Elk Creek. There are signs on Route 20 for several industries (including "Reddog Industries") that are located on this small road. Follow the road to the left, then past the industries to its end. The American Legion park is on the right, and the road continues straight down into a dirt parking lot along the creek. A short path leads downstream to this popular hole. The area upstream from the American Legion hole is flat and shallow for a considerable distance. There is good fishing upstream under a set of railroad tracks, but it is a long hike up the creek from the American Legion hole parking lot. There is good fishing later in the season upstream from the Gudgeonville covered bridge, but access to some parts of the creek is difficult. The area on all sides of the covered bridge on Gudgeonville Road (Township Road 400) is posted. Prior to 1999, the creek from Interstate 90 and south could be accessed from Beckman Road (Township Road 547) just south of where it passes over Interstate 90. You could park on Beckman Road and walk a long and sometimes steep trail down to the creek. Carrying fish home from this location is not recommended. If you are willing to walk a considerable distance just to get to the creek, you will find a beautiful area both upstream and downstream. However, since 1999 the area along Beckman Road is sometimes posted. The next popular access point upstream is at Folly's End Campground off Route 98 south of the Town of Fairview. This is about a mile south of the intersection of Route 98 and Interstate 90 (Exit 16 - Fairview). There is a tackle shop at the campground, which includes fly gear. There is also a sizable pool right at the campground that is popular. The fishing can be good both upstream and downstream from Folly's End. Upstream from Folly's End is the "Streuchen Flats" area. There is a parking lot and access area here. To reach this location, travel east on State Route 832 (Sterrettania Road) east of Route 98. Turn south on the dead end road known as Platz Road (Township Road 428), and follow it to its end. This road is not maintained in the winter. There is good fishing both upstream and down. There are several small access points along Sterrettania Road to the village of Sterrettania, then south along West Road toward Interstate 79. The last popular fishing area is at the big pool just south of the intersection of Interstate 79 and West Road at the McKean exit of I-79 (Exit 174). This pool is located behind a heavy truck repair shop and just south of the on-bound ramp to Interstate 79 north. This is the furthest point upstream the Fish and Boat Commission stocks brown trout, and it is a very popular hole on opening day. The PF&BC also occasionally places spawned-out steelhead in this pool. Godfrey Run is a nursery water and fishing in the creek is prohibited. 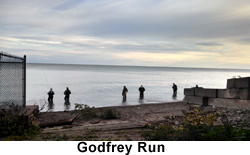 However, fishing at the mouth of Godfrey for steelhead and walleye is popular when lake conditions are favorable. The mouth of Godfrey can be accessed from Fairplain Road (Township Road 4031), which loops around south of Route 5. There is parking on the west side of the loop beyond the no parking signs. Walk back north and down the dirt access road to the lake. Like Godfrey Run, Trout Run is a nursery water and fishing in the creek is prohibited. 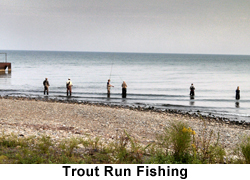 The mouth of Trout Run is the most popular place for shore fishing in the lake for steelhead and walleye. The Fish and Boat Commission maintains a nursery upstream on Trout Run, where it raises and milks steelhead. Thousands of steelhead return to Trout Run every year. This provides excellent fishing for steelhead off the mouth when the fish school trying to enter this relatively small and shallow creek. Likewise, when the fingerlings leave the creek in the spring, the walleye lurk just off-shore at night looking for an easy meal. If you want to see if the steelhead run has started, or if you want to see steelhead or show them to others, go to the mouth of Trout Run. In the fall the creek can be stacked with large steelhead, many with their tails sticking out of the water. It is a sight many children (and anglers) enjoy. 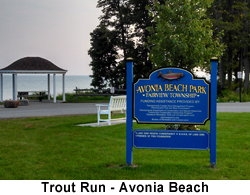 The mouth of Trout Run is at the foot of State Route 98 (Avonia Road) directly north of the town of Fairview. Parking is permitted only in certain areas along the road. Parking between 10 p.m. and 5 a.m. is also prohibited. Fishing for steelhead at the mouth of Trout Run is very popular in the fall. Fish can be schooling just offshore when the fish have not yet made any significant run up any of the major creeks. If the lake is relatively calm, the steelhead fishing can be very productive. On the other hand, this is no secret, and on a warm, calm day in late September or October, you will likely find anglers lined up shoulder to shoulder at the mouth. Until 2004 there was a marina in operation at the west side of Trout Run. You could park in the marina lot for a fee, and fish in the marina (in what was sometimes referred to as the "Pig Pen"). The marina closed in 2004 and currently you cannot park or fish in the marina area. Walnut Creek is the second largest and second most popular creek for steelhead fishing. Walnut begins south of the Millcreek Mall (which is just east of the the Kearsarge exit (Exit 180) of Interstate 79). It flows northwest through Millcreek Township, north through Fairview Township and enters Lake Erie east of the town of Fairview. The Fish and Boat Commission stocks Walnut with steelhead, but not brown trout, and it is not an approved trout water. During the summer and fall, the lower reaches of Walnut hold bass, panfish, catfish and carp. Like the other creeks in the watershed, by June most parts of the creek are low and too warm for trout and the fishing for steelhead is over. During early fall, steelhead may not get beyond the Manchester hole just south of the first bridge. The fish move upstream as the season wears on. By winter, steelhead can usually be found all the way upstream to the Millcreek Mall. 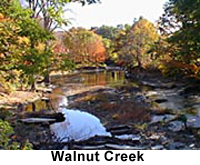 The Fish and Boat Commission maintains the Walnut Creek Access Area at the mouth of the creek. There is a nice marina with paved parking lots, a building with Fish and Boat Commission officials, a weigh station, ice and rest rooms. The launch ramps and docks are removed after the last Sunday in October, and after that fishing is permitted in the marina itself. The building closes in December. For further information, see the Marinas page. The mouth and access area can be reached from State Route 5 by turning north on either Dutch Road (Township Road 4007 - beside the Walnut Creek Grill) to the west of the creek, or Manchester Road (also Township Road 4007) to the east of the creek. There is a sign for the access area at the intersection of Route 5 and Manchester Road. Follow either road north to the access area. Fishing along the wall between the marina and the mouth of the lake is popular, especially in the fall. Access is easy and no waders are needed. This location is also popular for night fishing. It is relatively deep (it is dredged each year to maintain access to the marina for even larger fishing boats) and the water is usually slow-moving. Many still fish or fish with lures in this area, and very few fly fish here. During the early steelhead season, steelhead may be present only in this area, and in the first hole just south of the access area. During the summer of 1999 the Fish and Boat Commission, with the financial assistance of local contributors, created several new pools between the marina and the first bridge. This has become known as the "project waters." The objective was to create additional fishing opportunities on Walnut on property owned by the Commission. Many of these new pools hold many fish during the season, but pressure can be heavy. For further information from the Commission on this project, click HERE. The first original pool, referred to as the "Manchester Hole", is one of the most popular spots for steelhead fishing. This pool is located just south of the Manchester/Dutch Road bridge, just upstream from the access area and project waters. In the summer of 1998 the landowner first posted the east side of the hole, and fishing from or walking on the east bank is now prohibited. Fairview Township has also posted no parking signs all along both Manchester and Dutch roads, preventing parking on the street anywhere north of Route 5. As a result, to fish the Manchester Hole, you must park in the access area and either walk up the west bank, or walk along the street and enter on the west bank. If there are fish in Walnut Creek, there will be fish in this pool. It is deep and fairly long. Fishing pressure can be intense. Often there will be 30 or more anglers lining the side of the pool. It is seldom a place for peaceful, solitary fishing. Fishing in this pool is usually drift fishing (often with a small float) or fly fishing. Just upstream from the Manchester Hole is the "chutes" area. It is a short area of fast chutes, and often holds many fish. There is often controversy over whether people catching fish in this area are just "lifting" them by letting the hook drift into their mouths, then "lifting." Upstream from the chutes are several pools, then a waterfall. Often the steelhead have a difficult time getting over this waterfall. As a result, often the fish are stacked-up below the waterfall, and there are few fish anywhere above it. If the fish have made it past the waterfall, Walnut Creek is fished extensively from the first pool to the Route 5 bridge, and upstream to the tubes under the railroad tracks. Limited parking is available along both sides of Route 5 (although sometimes it is posted), and you can walk down rather steep trails on the north sides of the road to the creek. There is a good sized pool immediately downstream from the bridge, and fish often hold in the tube under the road. The creek can also be accessed beneath the railroad tracks from either Manchester or Dutch Road. The tracks are located between Route 5 and Route 20. The access is from the northernmost set of tracks. On both sides of these tracks you will find a path leading down to the creek. Many drive along the track bed and park by the trails. There is a nice pool just downstream from the tube under the tracks. Fishing is decent downstream from here to Route 5. Fishing is also good upstream (especially around the bridge for the second set of tracks), but a short distance upstream the creek is posted and access ends. The next access above the tracks is at the Walnut Creek Gun Club. This area is located at the bottom of Walnut Creek Hill on Route 20, between Dutch Road and Manchester Road. Drive into the Club lot, then to the left into a small dirt parking area. There is good fishing just downstream from and inside the tube under Route 20. This spot also provides access to the area upstream, where the creek runs through mostly wooded and undeveloped land. Although pleasant, there are not many good holding areas until you get a considerable distance upstream. The next access road to the creek is Millfair Road, on the Millcreek/Fairview Township border. There is a small parking area just south of the bridge on the east side of Millfair Road (although sometimes this is posted). There are several good areas a distance downstream. There is also a good-sized pool just upstream from the bridge just before the bend in the creek. The next upstream access is at Old Sterrettania Road (which is just off Sterrettania Road - State Route 832). Parking is available next to the bridge. Downstream around a few bends is Buttermilk Falls, and there is a nice pool there just below the falls. Upstream from the bridge the creek passes under Sterrettania Road. There are some good small pools and pockets upstream from the bridge. The area upstream from Sterrettania Road is rapidly becoming developed into residential and retail areas. Although there are some good fishing spots, access is becoming more and more difficult, and fishing in the shadow of a house or store lacks some of the charm of fishing in the shadow of tall trees. Cascade Creek is a small stream that runs through the City of Erie. It is tubed through part of the City. Cascade Creek empties into Presque Isle Bay just west of the Niagara Pier condominiums. Cascade Creek is stocked with trout during the regular trout season. It is stocked from its mouth, through Frontier Park, to just south of West 8th Street. The creek can be accessed from Frontier Park, between West 6th Street and West 8th Street in Erie. There is also public parking for up to 50 cars in a paved parking lot beside the lower part of the creek, off the Bayfront Highway just south of the Niagara Pier condominiums. Park just to the south of the small administration office for the condominiums. To access the lower regions of this creek, walk over the wooden bridge, then north along Cascade Creek to its mouth at the Bay. Four Mile Creek is the first fishable tributary stream to the east of Presque Isle Bay and the City of Erie. It is small and the fishing is limited to the area north of Route 5. To access this area, you must drive past a number of angler-unfriendly signs posted by the GE golf course and the Lawrence Park Country Club. Turn north just east of the intersection of East Lake Road and Iroquois Avenue, and you will see the creek on your right. If you drive to the end of the road past the golf course and the club, there is some parking by the lake just east of the fishing club. There is a road that goes east over the creek to the country club. Just upstream of this bridge is a large dam that blocks the passage of fish. Sometimes the club will reduce the obstruction of the dam, but further upstream (and before Route 5) is a waterfall. 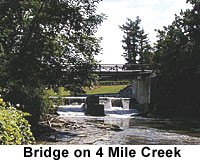 Seven Mile Creek is a very small creek located in Harborcreek Township. From its mouth to Route 5, the creek is located on the grounds of Glinodo Center, which is owned and operated by the Benedictine Sisters. Walk-in fishing is permitted, but you must park on Route 5 and walk in. The creek will be off to the east. Just upstream of Route 5 is a waterfall that stops the upstream run of fish in this creek. Currently, the landowner has posted the property south of Route 5 and fishing is not permitted from Route 5 to the waterfalls. Please be courteous and respectful to the Sisters and their property. 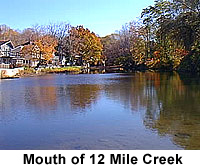 Twelve Mile Creek is located primarily in Harborcreek Township in eastern Erie County. This is a small creek and is not an approved trout stream. Its mouth can be accessed from Shorewood Drive, which is immediately north of Mooreheadville Road (Township Road 1006). From Route 5, turn south on Shorewood Drive to the lake. The creek will be to the east. There is parking available at the mouth in a dirt lot. There is decent steelhead fishing in this creek from the mouth, under the Route 5 bridge, and at the sizable hole just upstream from the Route 5 bridge. Just upstream from the bridge there is a quick rise in the creek bed that fish rarely pass. Sixteen Mile Creek is the second largest of the eastern creeks. It empties into Lake Erie directly south of the town of North East, at the northern end of State Route 89 (Freeport Road). It is not an approved trout stream. Ample parking is available at "Halli Reed Park" located at the mouth of the creek. At the mouth there is some relatively deep and slow-moving water. The creek winds up to Route 5, then toward the town of North East. There is good fishing below Route 5. Just upstream of the tavern and the Route 5 bridge is a nice pool, and limited parking is available on Curtis Road. A short distance up from Route 5 is a waterfall which stops the upstream runs of most fish (although some fish, especially coho, can and do make it beyond the falls). A short distance above the falls, on North Mill Street, is the sewer plant. Anglers park at the sewer plant and fish downstream below the falls. The warm water discharge from the sewer plant often keeps the lower parts of 16 Mile Creek ice free when all the other tributaries are frozen-over. On the other hand, the waters below the plant sometimes have a less-than-pleasant odor. Twenty Mile Creek is the largest of the eastern creeks. The mouth and the lower four miles of the creek are in Pennsylvania, while the upper reaches are in New York State. The mouth of Twenty Mile Creek is located about one mile west of the New York State border, and just east of the North East Marina. Its mouth is located almost due north from the Stateline Exit (Exit 45) of Interstate 90. This creek passes through a beautiful grape-growing region of North East Township. 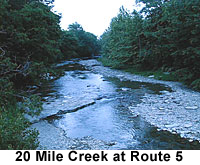 Twenty Mile Creek is an approved trout stream which is stocked with brown trout just before the trout opener. It is also the most popular steelhead fishing creek in the eastern part of the county. There is no vehicle access to the mouth of Twenty Mile Creek. The first access upstream from the mouth is from Route 5. You can park along Route 5 near the bridge. In 2004 the Township posted Route 5, but constructed a new angler parking lot just west of the creek on the north side of the road. A path will take you from the parking lot along the west side of the creek to the mouth. There is no access to the mouth from the east side of the creek. There is a relatively large, wide and slow moving area at the mouth. The east side of the stream mouth is posted. Just upstream from the mouth is a short area of deep water and riffles that has good holding properties. North East Township has purchased the land near the mouth of Twenty Mile Creek and a stream improvement project is contemplated there in the near future. Just upstream from the bridge at Route 5 is a good sized pool, just below a sizable waterfall and the abandoned iron bridge. However, in 2004 the landowner who owns both sides of the creek south of Route 5 posted this area. Currently there is no fishing at all south of Route 5 for a considerable distance upstream. After the creek level rises, fish can get above the falls at the iron bridge to the upper reaches of Twenty Mile. The first upstream access point is on the west side of the creek at the intersection of Middle Road (SR 1014) and Hirtzel Road. To the right of the farm field you will find a nice path that leads to the creek. Further upstream on Hirtzel Road and just north of Interstate 90 you will see Hirtzel Pond, which is stocked with trout by the Wesleyville Conservation Club. There is limited parking along the road by the pond and a path to the north of the pond leads down to the creek. The only access to 20 Mile in the area south of Interstate 90 and north of Route 20 is from the west end of Stinson Road, where Gay Road makes a sharp bend. Stinson Road dead ends and the path to the creek begins at the end of the road. 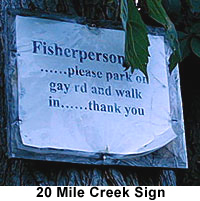 A sign just before the road ends requests that anglers park on Gay Road and walk in. The next access point upstream is just south of Route 20 on Gulf Road (S.R. 1017), just before the railroad underpass. Gulf Road is the first road to the east of Interstate 90 Exit 12 heading south. There is limited parking on Route 20 and on Gulf Road. A steep path leads from Gulf Road down to the creek. Here there is a concrete run under the railroad bridge just upstream from the Route 20 overpass, and there is a pool just downstream of the concrete. The creek is posted from the concrete under the railroad bridge upstream for several hundred feet. The posted area includes the old "snake hole." Like all these creeks, 20 Mile runs through private property and is open to fishing by the courtesy of the landowners. Please be courteous and clean.